When you think of a fireman, do you think of someone with a moustache? Just wondering, because much like everything else in the fire service, they are steeped in tradition. Well, since the 'stache has become a subject of interest again lately in my department, I wanted to show a couple of photos of me with a REAL moustache... If only my actual moustache looked like this... These pics are from Halloween a few years back. I would have won the "gayest costume" award for sure, but The Ambiguously Gay Duo, Ace and Gary, were there. Pics are here. And, yes, it is fun to stay at the YMCA. We adopted a new puppy from the animal shelter to keep Stoli busy. Her name is Sadie, and she is a black lab mix, about four months old. It is working out pretty well so far. They are best buddies after only a single day together, and are virtually inseparable! So much energy! See the pictures here! 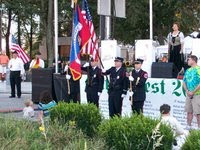 The Belleville Firefighters IAFF Local 53 Honor Guard members presented colors at the annual event held every September in Belleville's Town Square. I was there, and enjoyed presenting with my fellow firefighters. Here are the photos! Great news... I was able to get the last three classes I need for my Fire Science degree from a different college than the one I normally attend. So, I am scheduled to take four classes total, for twelve more credit hours this Spring... Fire Service Instructor II, Fire Service Management I, Fire Tactics & Strategy, and Fire Prevention Principles. The coolest part? I will graduate in May! I am really looking forward to being done for a little while to concentrate on the house and my hobbies again. Something else I miss when I am in class is recreational reading. I have a couple of books I just started which I am anxious to continue with. One is the John Lennon biography which was released just this last fall, and the other is "Too Fat To Fish" by Artie Lange. I will be starting on a new Battalion at work next week. I have been promoted to Engineer, which means I will be driving the truck, and filling in as Captain when mine is off. I am assigned to the oldest fire station in town. Though it is the farthest from my house, I enjoy the engine house. I got a decent crew, too, so that makes it all the better. Gonna run for now. It is going to be fifty degrees in the St. Louis area today, and I am stuck inside -- I have to prepare for an exam this afternoon. Blah.